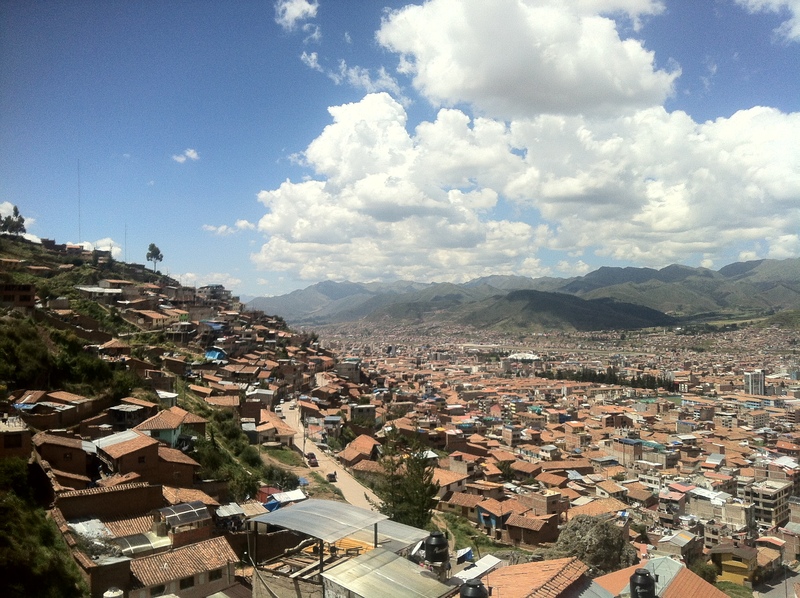 It took us several days to get adjusted to Cusco, our new home in southeastern Peru. As the city’s elevation is around 3,400 m or 11,200 feet and its location is near the Urubamba Valley of the Andes mountain range, we all had various degrees of altitude sickness and were cold to the bone (although the days here are filled with sunshine, the morning/evening temperatures drop substantially and there’s little to no heat in the local guesthouses or apartments – a real adjustment from tank tops and flip flops in Asia)! Casa Hospedaje Familiar “Sihuar” (casasihuar@hotmail.com) was a good hospedaje to get our bearings. The place was basic and cold but its warmth came from the lovely owners, Sonia and her husband Luis. Noticing that Emile had some bad “altitude” headaches, Sonia, who is a local, natural healer, jumped in with cups of Mate de Coca (special tea), head massages and an herbal extract that she made him smell and breathe in deeply – a couple of days later and we had our energetic firstborn back! The local pharmacies also seem to cash in on the gringos having to adjust to the city by selling red & white “soroche” pills. I did pop a few in the initial two days and they seemed to do the trick. But it was Lainie who taught us about the local ways of dealing with altitude sickness. Altitude sickness, not so much fun! 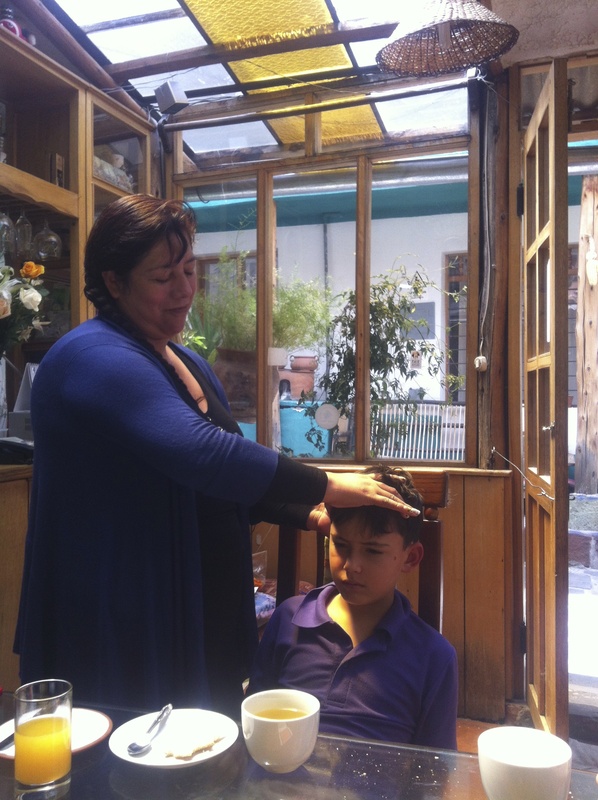 But healed with a head massage, coca tea & some herbal extracts from Sonia Velazco Flores at “Sihuar”. During our first 6-hour hike with Lainie, Miro and a few other wonderful families, Lainie designated Emile to be the carrier of the coca leaves & llipta and gave him a special carrying pouch. We learned that offering a handful of coca leaves to the local Quechua is a sign of respect, and much appreciated by this indigenous, ethnic group of people. These coca leaves (typically raw leaves from the coca plant) are used to brew an herbal Coca Tea or Mate de Coca (also called Mate). Widely available in Peru, this greenish/yellow infusion with its mild bitter flavor and organic sweetness is just enjoyable or used to treat altitude sickness. In addition, the locals stack a few of the coca leaves in a pile and sprinkle on some llipta (black/greyish rock of ash), then fold it into a tiny blanket and put it in the inside of their cheek. Once softened, this chewy package is supposed to provide oxygen and help combat the symptoms of dealing with high altitudes. Of course, some of us gave this a try although I later learned that in 1961, the coca leaf was listed on the UN’s list of narcotic drugs, together with cocaine and heroin! (Oh well, starting to experiment with drugs for the first time at the age of 44 should be considered a life experience on the Regeneration Tour, shouldn’t it?). Emile had great fun handing out coca leaves to the Quechua on our fantastic day-hike of the Inca (and pre and pre pre Inca) ruins in the area, so gracefully guided by Lainie (we visited the Monkey Temple and the Temple of the Moon in Sasayhuaman, as well as the ruins of Quenqo). To make the most out of our 4 months in South America, we became members of the South American Explorer’s Club (www.saeexplorers.org). With offices in Lima & Cusco, Peru as well as Argentina, Ecuador and Bolivia (some of the next destinations on our hit list! ), this Club aims to promote a deeper understanding of South American history & culture by providing unbiased information, lectures and in-country clubhouses. 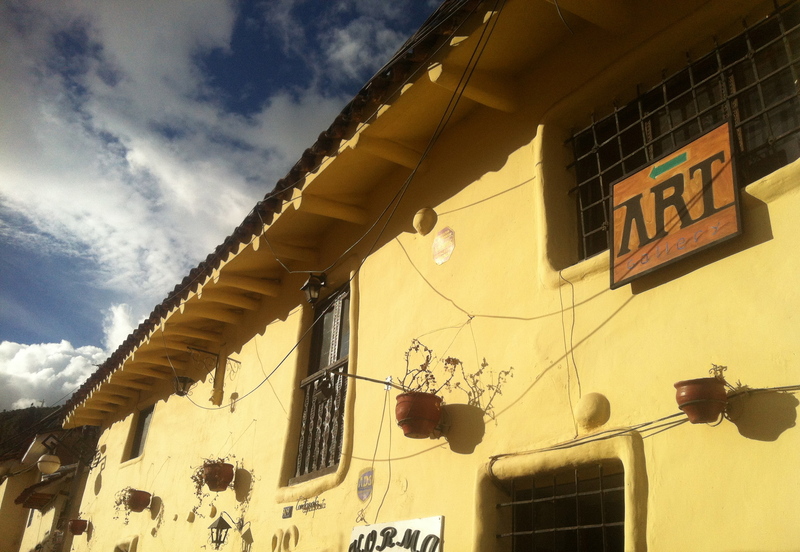 With Claire’s help from the Club (she translated all the apartment ads for me in English), we found our 2-bedroom apartment on Calle Lucripata (just slightly north of the popular San Blas area). William the owner’s son, quickly did whatever he could to make us feel warm (2 heaters!! ), and at home. 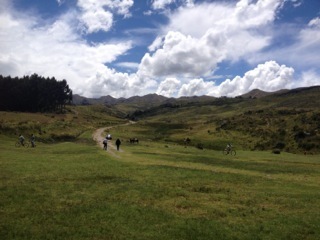 Once settled and free of altitude symptoms, we hit the ground running to find Spanish and music lessons for the boys. 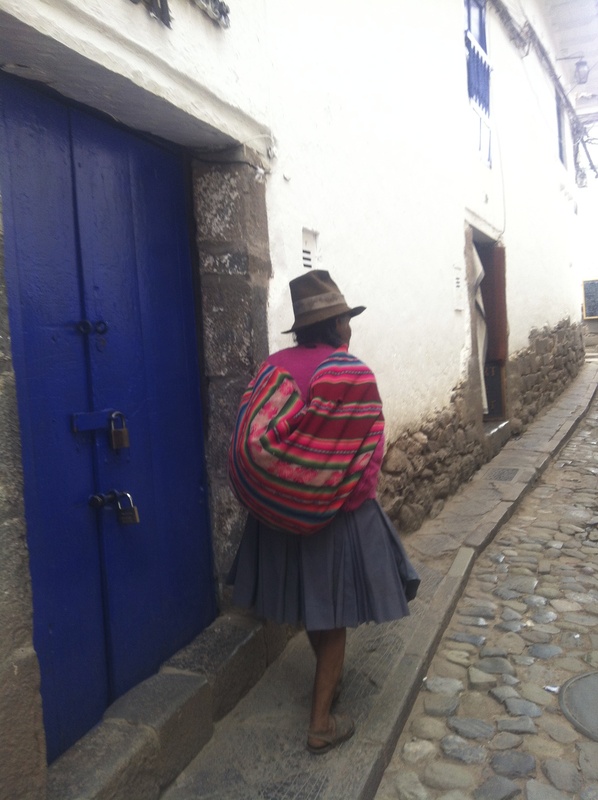 For language acquisition, we landed on Proyecto Peru (http://en.proyectoperucentre.org/index.html), a program accredited by the Peruvian Ministry of Education. 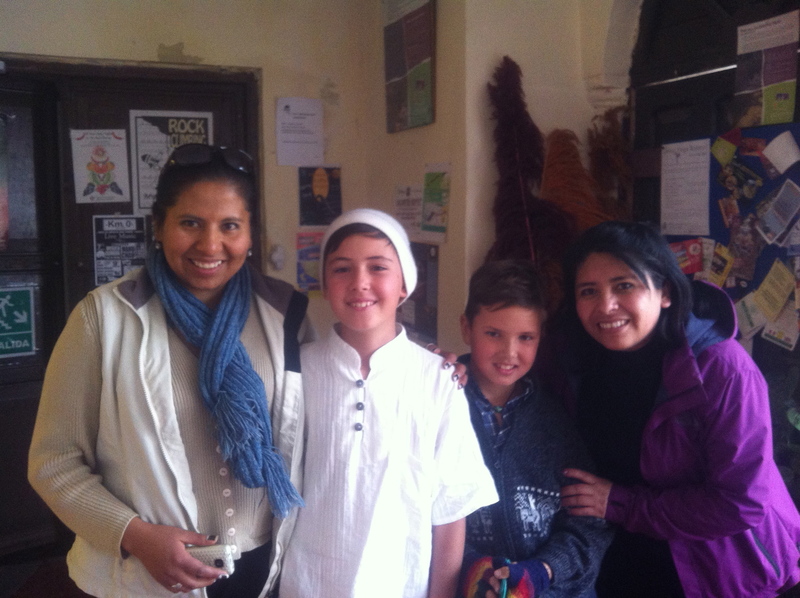 Assisted by Sonia and Jessica, two lovely Peruvian teachers, Emile and Filou are now learning Spanish on a daily basis. They love it, as their private classes consist of an hour of fun instruction and another one of outdoor learning (going to the market to learn about fruits & vegetables, clothing etc.). This interactive method of teaching works very well for our active boys and Papa & Mama will join them soon! 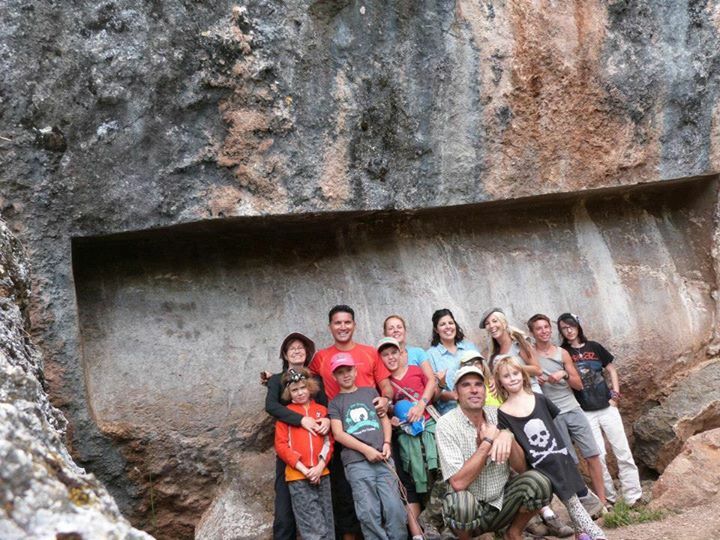 And who best to help you settle into a new city then a great group of travelling friends and local families (there are lots of expats and long-term travellers here in Cusco!). It was Rhoni and her lovely son Dylan (already best buds with Filou), who took us around town on the first day and showed us Mercado Central de San Pedro (a fantastic local market where we were pointed to the best juice, vegetable, fruit and nut ladies) and the historical district with its famous Plaza de Armas. And then there were Kim and Scott, the super nice Americans and their fantastic kids Kane and Kat, with whom we quickly bonded. They showed us some great restaurants and gave us insights into local vendors, play parks and must-see attractions. During one of our recent restaurant outings with them, Emile had his first meal of Alpaca meat. 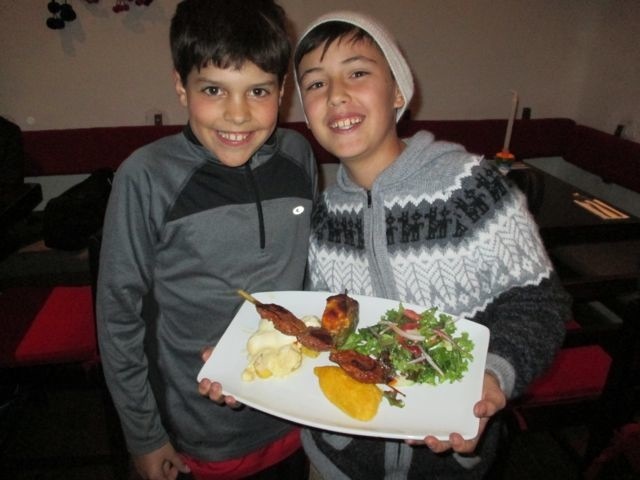 This dark and juicy beef-like meat that is a standard of novo-Andean cuisine was a great hit with him and his new friend, Kane. 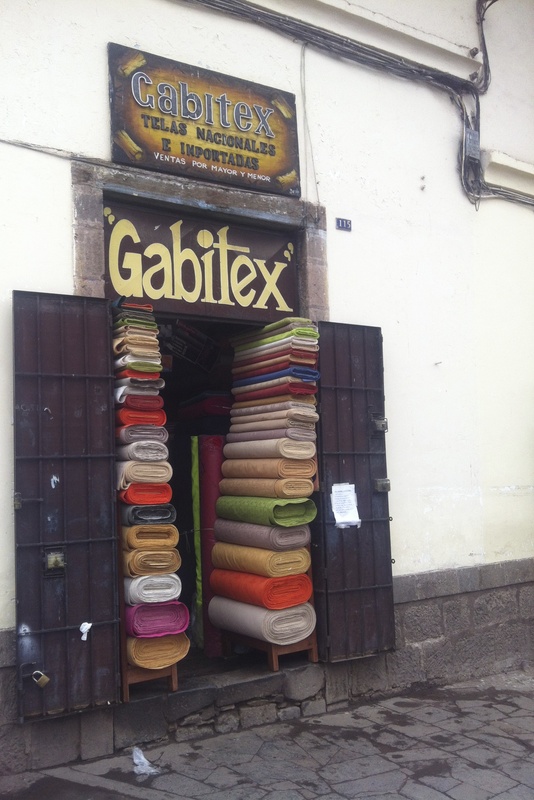 But not only can you eat Alpaca in Cusco, you can also see the animals roam around town. The Alpaca is one of the two domesticated relatives of the Camel (the other is the Ilama). 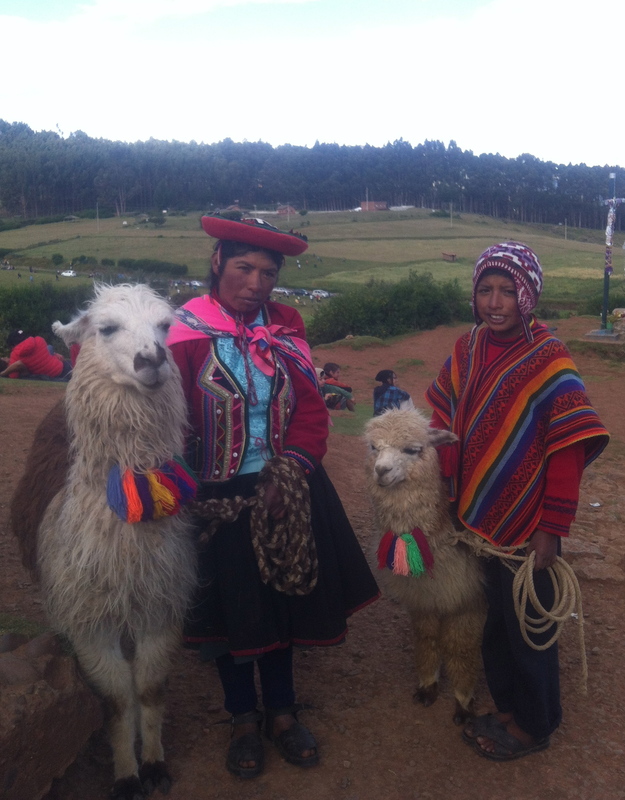 Civilization was built in the Andes on the Alpaca but now they are also used for tourism (for 1 or 2 sol you can take a picture of these interesting creatures and their colourful owners). 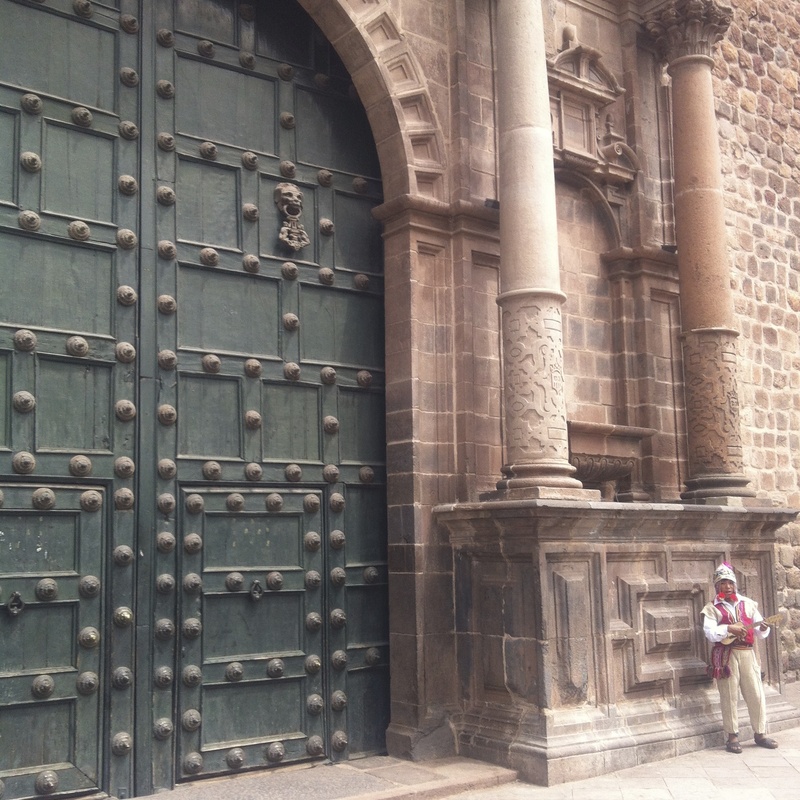 The city of Cusco, declared a UNESCO World Heritage Site in 1983, has a delightful, old-world charm. 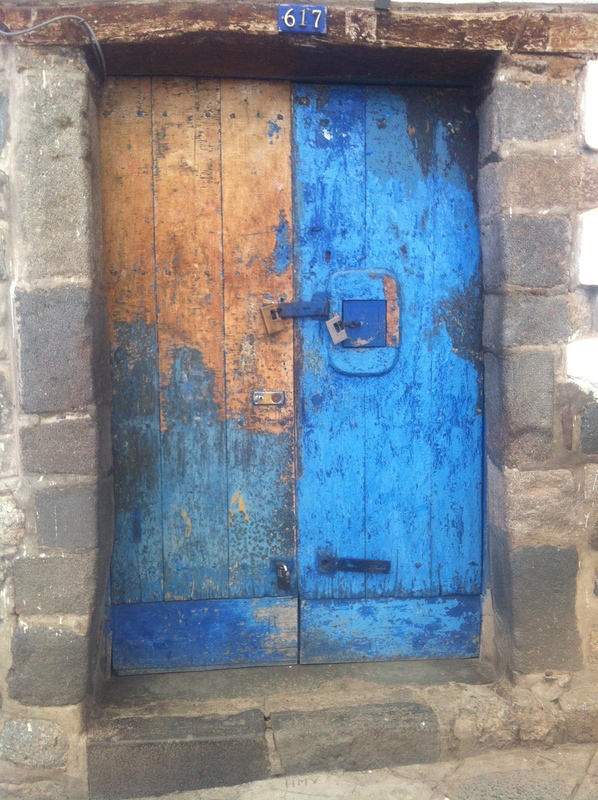 Its narrow, cobbled streets with bright coloured balconies & doors and its incredibly kind people wrapped in colourful weavings are surely going to take our hearts and breath away! It’s a sure thing, we are going to love our month here…the kids are already talking about staying longer. Esta ciudad es fantástica!